Come and join me for an early brunch. 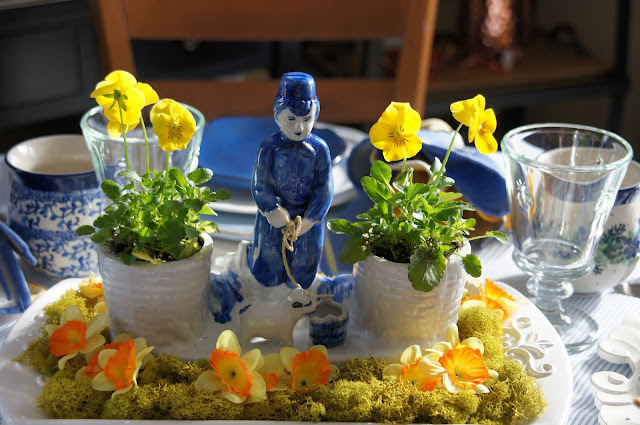 Since it's finally acting like spring here and the tulips will be blooming soon I decided to use my vintage dutch boy planter for my centerpiece. I love mixing all these different dishes together! 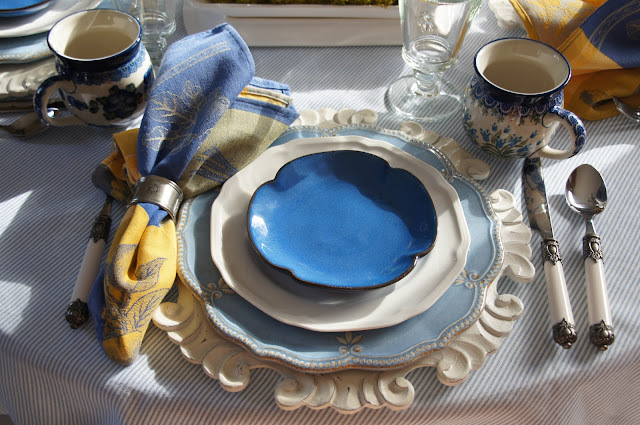 The lighter blue plates are actually melamine. 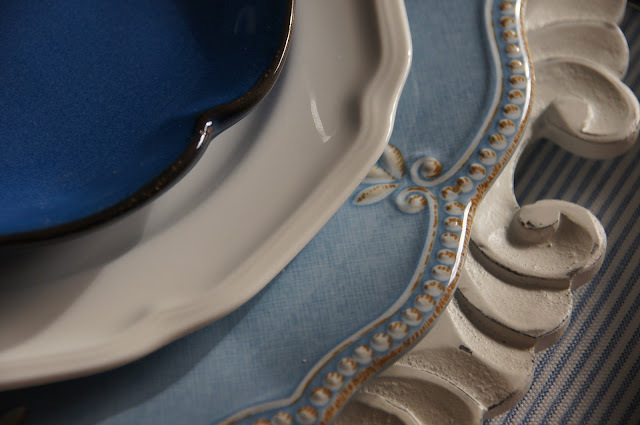 I've seen some surprisingly beautiful melamine dishes lately- very impressive. When I got my little dutch boy vintage planter (bottom is labeled Bloom Rite - 1950’s) his hands were empty. I studied it for a bit and decided he needed a rope- figuring he would have lowered the bucket into one of the two wells for the little lamb to drink from. 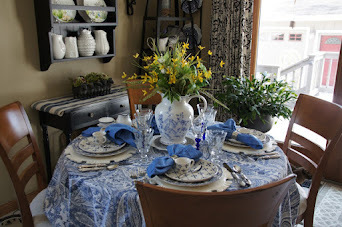 I chose to use my Polish Pottery coffee mugs for their blue floral designs and this one has tulips! Morning's light is so perfect. I used a narrow oblong white dish for the arrangement. I turned a second one upside down below it to give it more height. I stuffed some reindeer moss around the base along with some silk narcissus stems that I tucked in below the planter. I found some violas that were the perfect small size to fit the planters. They'll go outside later on. The snow has finally melted and we can see the ground again! Thanks for stopping in and I hope you've enjoyed Brunch With My Dutch Boy! So pretty. The pansies are fabulous and your little Dutch Boy is beautiful. Love your dutch boy and I love the blues and yellows. 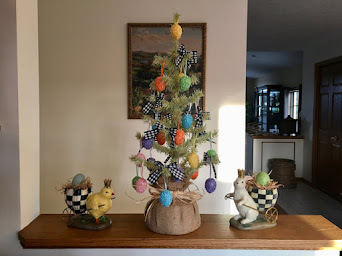 That is really springy! Those coffee cups are so sweet. Hope your week is starting out great. I thought you were talking about paint when I read the post title. HA! HA! 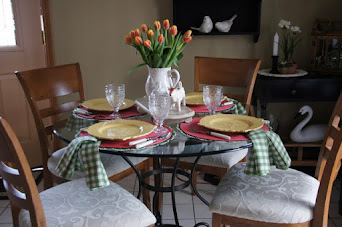 Your table is so pretty and perfect for the beginning of May. 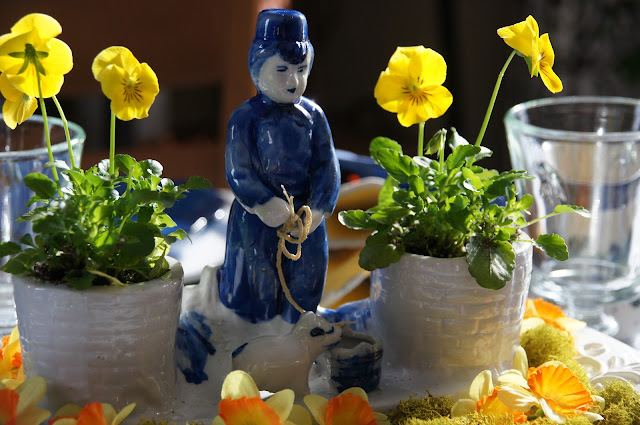 The dutch boy planter is so cute. My dad is from Holland and so your "dutch boy" table really speaks to me for that reason but also because it is so lovely. You were smart to put that rope in his hands - looks meant to be! The colour palette is very pretty and how wonderful it must be to sit there in that glorious sunshine after such a long winter! So much to love about this tablescape, starting with the Dutch boy. Where did u find him? 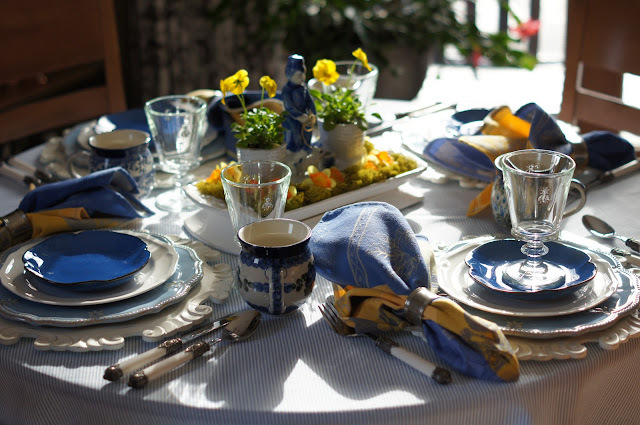 I'd have never guessed about the blue plates, they look so elegant. And, those coffee mugs....want, want, want! Not only is the pattern lovely, but the shape is great. 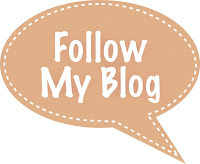 Get OUT OF HERE!!! Melamine??? They can’t be! What? No!!! Really? Wow...melamine HAS come a long, long way!!! This is one of your prettiest tables! 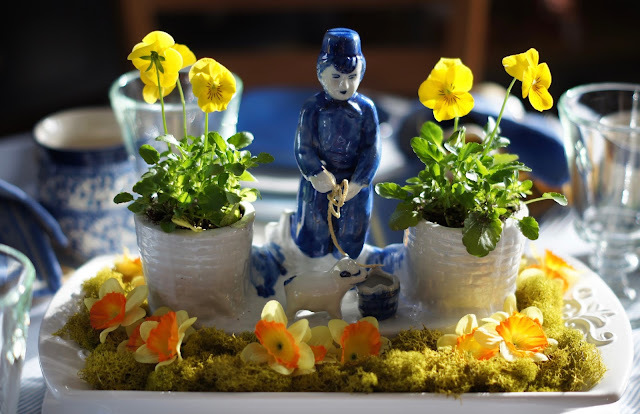 You did an outstanding job of mixing dishes, and the Dutch Boy planter is such a unique accessory. This is a classic tablescape without being stuffy or too serious. Know what I mean? 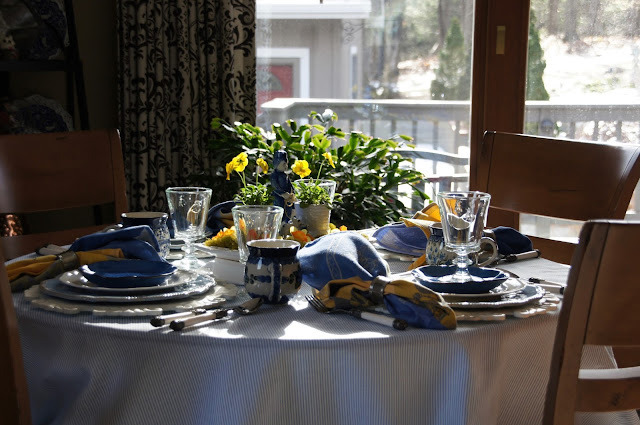 It’s a tablescape that could be appreciated by so many!!!!! 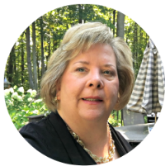 This is so cute Liz, and perfect to welcome Spring! Love the little dutch boy. I have a Dutch boy cookie jar I bought from one of the estate sales I helped host. 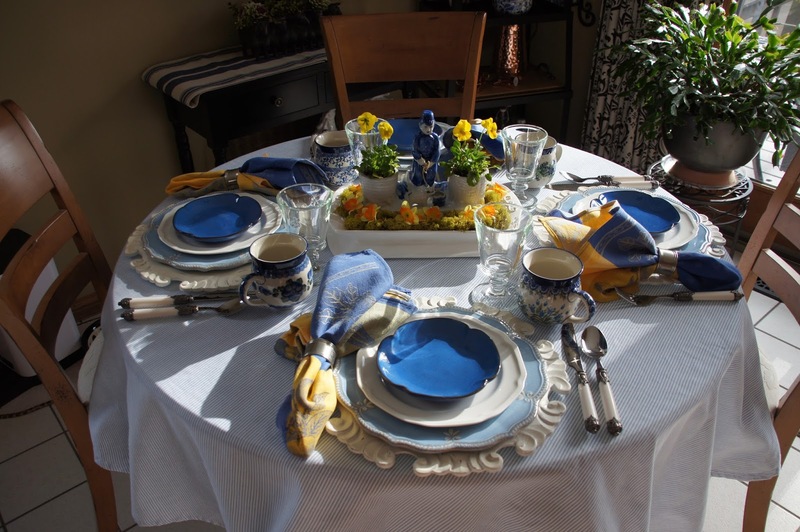 I've set my table in blue and yellow for May as well. 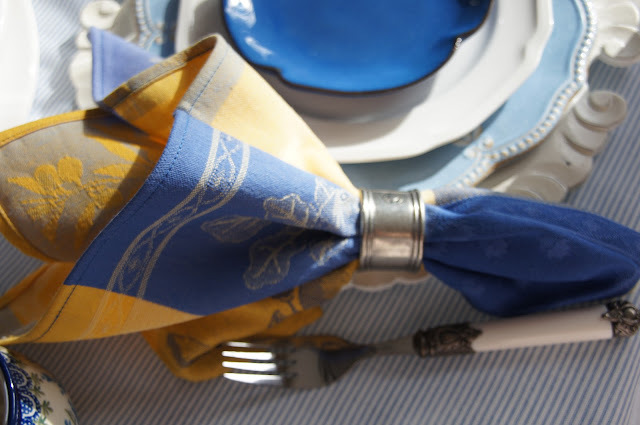 Love the cheery color combination! Very cute table with the sweet Dutch boy. Mixing different dishes is so fun. melamine is a great alternative to entertaining. They make some very pretty dishes now days. What a pretty table! I love all of the blue, and what an unique piece your Dutch boy planter is! I hope your tulips will be blooming soon! 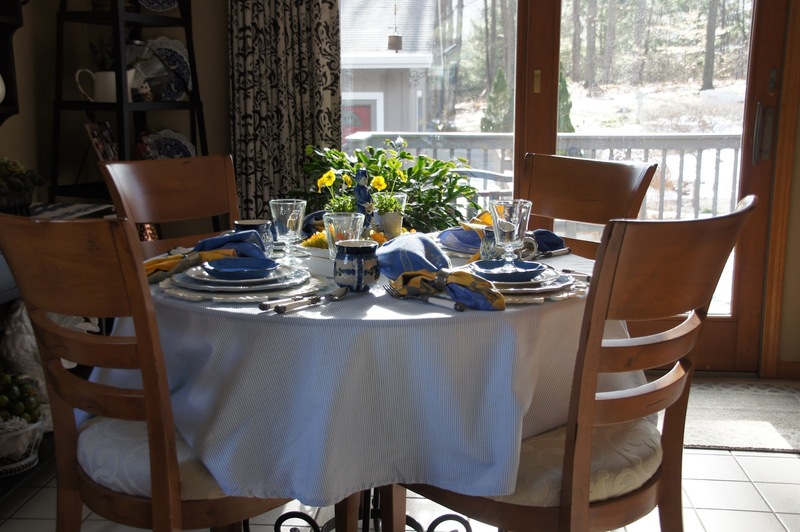 Love your blue and white table. The Polish mugs are gorgeous! I agree with Alycia melamine has come a long way. Your tables are so pretty and creative. Thanks for joining us again at Celebrate Your Story, have a great weekend. 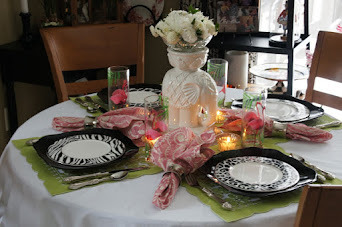 Oh my, what a beautiful table sweet Liz. I too agree about melamine. 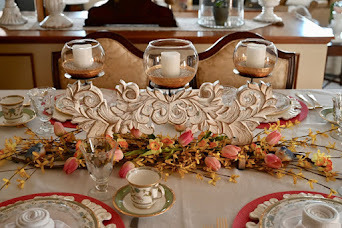 We bought our daughter for her beach apartment a gorgeous china with a sea design from Bed Bath and Beyond and it looks amazing in a tablescape for entertaining, she always gets compliments on it. Love those Polish mugs too. 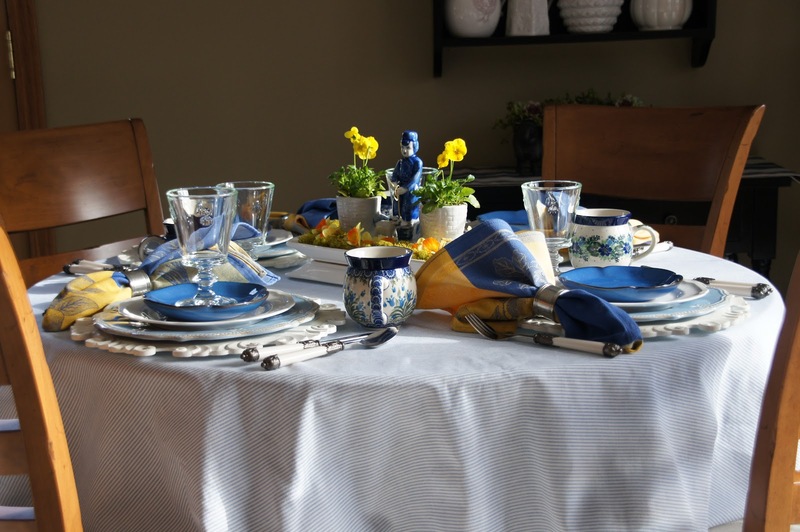 What gorgeous melamine pieces and I ADORE your Dutch boy centerpiece…so smart to add some twine for the sheep! 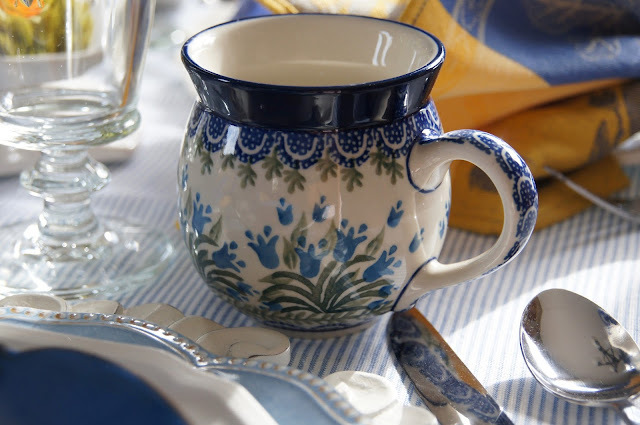 There is something so cheery about blue and yellow together and your Polish Pottery coffee mugs are so pretty!